President Colin Vane & Pat Cannon Chairman of Tandridge District Council make their way to the centre of the Purple Crocus Maze. For over 30 years, Rotary worldwide and its members have been committed to fighting to eradicate polio across the world. 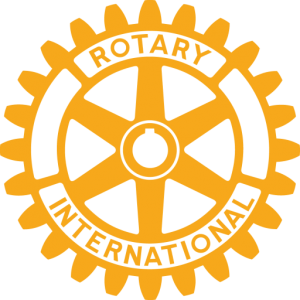 The amount of polio-endemic countries has dropped from 125 to just three, (Nigeria, Pakistan and Afghanistan) with over 2.5 billion children receiving vaccinations thanks to the help of Rotary. It was 6 years ago when Caterham Rotary Club first planted the Purple Crocus Maze in Queens Park Caterham in support of the eradication programme. The purple colour symbolises the purple dye that is painted on the little fingers of small children to show they have been immunised. Last Wednesday a special celebration was held in Queens Park to witness the unveiling of an enhancement to the Maze – a whole range of stepping stones sponsored by local school children and organisations who also attended the event which included a “Purple for Polio” cream team. Colin Vane Caterham Rotary President thanked over 80 guests for coming along and went on to say “this is one of many simultaneous Rotary celebrations being held currently at 4.00pm across Great Britain & Ireland supporting both Polio eradication and International Women’s Day. The aim is to eradicate Polio completely by 2020.